^ "ISO/IEC 19501:2005 - Information technology - Open Distributed Processing - Unified Modeling Language (UML) Version 1.4.2". Iso.org. 2005-04-01. Retrieved 2015-05-07. 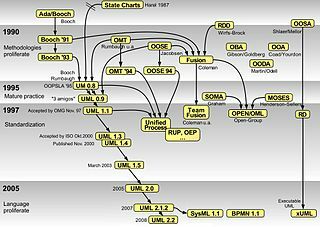 ^ "ISO/IEC 19505-1:2012 - Information technology - Object Management Group Unified Modeling Language (OMG UML) - Part 1: Infrastructure". Iso.org. 2012-04-20. Retrieved 2014-04-10. ^ "UML Specification version 1.1 (OMG document ad/97-08-11)". Omg.org. Retrieved 2011-09-22. ^ "UML". Omg.org. Retrieved 2014-04-10. ^ "Will UML 2.0 Be Agile or Awkward?" (PDF). Retrieved 2011-09-22. ^ "A Formal Treatment of UML Class Diagrams as an Efficient Method for Configuration Management 2007" (PDF). Retrieved 2011-09-22. ^ "James Dullea, Il-Yeol Song, Ioanna Lamprou - An analysis of structural validity in entity-relationship modeling 2002" (PDF). Retrieved 2011-09-22. ^ ""Reasoning about participation constraints and Chen's constraints" S Hartmann - 2003" (PDF). Retrieved 2013-08-17. 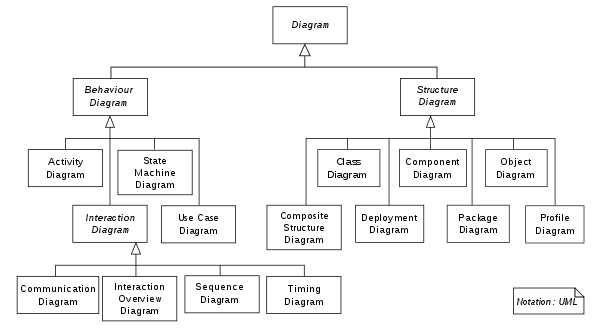 ^ "UML 2.0". Omg.org. Retrieved 2011-09-22. ^ a b c "UML". Omg.org. Retrieved 2011-09-22. 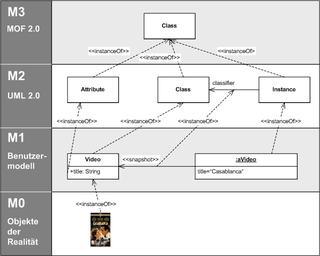 ^ "UML 2.5.1 specification". Omg.org. Retrieved 2018-10-24. ^ OMG. "OMG Formal Specifications (Modeling and Metadata paragraph)". Retrieved 2016-02-12. ^ "Issues for UML 2.6 Revision task Force mailing list". Omg.org. Retrieved 2014-04-10. ^ "UML 2.4.1 Infrastructure". Omg.org. 2011-08-05. Retrieved 2014-04-10. This page was last edited on 3 April 2019, at 14:38 (UTC).